The criss-cross design brings spine into a proper alignment and prevents hunched shoulders or back. It also helps to reduce back and shoulder discomfort because of improved posture. Adjustable straps and waistband offer a true, customizable fit for optimal support. Elastic straps are covered with soft, cotton fabric, which prevents pinching or skin irritation. Is the Posture Sport Support right for me? Improve posture, reduce chronic shoulder, back and neck pain, and relieve arthritic pain. Ideal to wear daily, not for contact sports or high-impact activity. Try our Brace Advisor for personalized product recommendations to meet your needs! Prevent hunched shoulders, achy neck and sore back. The Saunders Posture Sport Upper Back Support improves posture while doing daily movement (walking, working, heavy lifting, sitting at a computer and low to moderate activities). What sets this apart from other braces is that it anchors at the waist to stay in place, all day. Made with elastic it is covered with soft cotton fabric to prevent any pinching or irritation, simply adjust the straps to find the best, personalized fit. Maintain perfect posture because of the criss-cross design, which prevents a hunched back and shoulders. The back support works for both men and women. The Saunders Posture Support is ideal to wear daily, not for contact sports or high-impact activity. 6-8 hours a day should be fine. Hello I was wondering if this shows at all thru clothing? The Saunders Posture Sport Upper Back Support is low profile and should not be visible under loose fitting clothing, however if you are wearing tighter clothing it may be visible. Is this product completely latex free as I am deathly allergic to latex. Also is this the same brace as the DJ orthopedics s'port brace? I do know that it is latex free. Thank you. My waist is 40 inches. Should I get a medium or large. I'm kind of on the border. 1. I have spasms through the upper inside blades of my back. I am looking for a brace that will give me support. Do you think this would help. Also do you have any size larger than large? I have a very full bosom, and sometimes it causes my back and shoulders to hurt. Would this brace help ease some of that pain? The sizes given for the brace are S M and L — for women or for men? You say in one reply that it can be worn while golfing. Another product I tried had straps under the arms that cut off circulation while bending forward (as one does in the golf stance/swing). Would this occur while wearing your brace? You also provide a link to another section of your site for products that might also help for golf but they appear to be more football-related and for individual should problems. Perhaps the link got misdirected? The size chart is universal. Measure your waist at the belly button to get the measurements. Out of all the posture supports this one would be the best for someone who wanted to wear it during an activity such as golf. I started to have shoulder and upper back pain since I slouch really bad. Do you know if you are supposed to wear this all day? or only a few hours a day? can you wear clothes on top of it? 1.Does this help in correcting uneven shoulder blade/ alignment? 2. Besides this, do u have any other products which have such similar function? This will not correct that condition but will help bring the shoulders back to correct posture. There is not a brace that will correct uneven shoulder blade alignment. Several years ago i possibly dislocated my right shoulder water skiing. It has bothered me with use, especially reaching and extending while scrubbing things. It seems to roll forward and has a kno on the top towards my neck. It has began to make my arm tingle when i use it a lot. It feels much better when I push back on my shoulder and the tingling stops. Will this brace help? How I can pick my size? I have attached the link to the Sizing Chart. You will need to measure your waist. Do any of your braces fit petite sizes? I have 4 fractured vertebrae and need upper body support to permit mobility. Our Saunders Posture Sport Upper Back Support is sized according to waist circumference. We do not have petite sizing, I apologize. My husband has begun to bend forward at the hips. His shoulders are also rolled forward and the way his arms hang away from his body, his elbows remind me of a vulture. He also walks with his head down looking at the ground. He has had 1 1/2 knee replacements but that didn't seem to affect his posture (4 years ago). Those surgeries were very effective. My main concern is his bending at the hip. He is 73 years old but until recently he looked and acted like a 60 year old. Do you think this brace will help any of his problems? I have been researching braces for quite a while and this one may be my answer. By the way, he is in good health. The Saunders Posture S'port Upper Back Support will help your husband with his upper body posture by bringing his shoulders back. This may encourage him to straighten out at the waist but the support itself may not do that by itself. Most likely he is bent at the hips because the hip flexor muscles in his legs are tight. There really isn't a brace that will correct this, only a stretching program will help increase his flexibility. Having him keep active should help as well, the muscles can shorten up with prolonged sitting. Please resend answer to question regarding the use of a back brace for ankylosing spondylitis. I had problems and deleted it. My waist is 31". I'm 5'7". Should I order a medium or small? Seven weeks ago I had open heart surgery. I am having difficulty keeping my rib cage stable to heal correctly, especially when I sleep. Would the posture sport support be a good option since it appears to control torsion of the back to a small degree. Symptoms are clicking of my chest and spinal and neck discomfort. This seems to interfere with my ability to get a good nights sleep. Thanks for your help. Is the Saunders Posture S'port billable through insurance? If so, what is the proper HCPCS code? I just need to straighten to tho of my spine. I slouch really bad. Will this help or fix my issue? John this brace will help your posture by bring the shoulders back. About 3 1/2 years ago I was in a rollover accident in a semi. Among a long list of other injuries, I broke 5 vertebrate in my upper back right between my shoulder blades. Every since then I can't stand to do any desk work, eat at the kitchen table, wash dishes, basically every action that involves looking down or sitting. While sitting, if I put my feet up on something and lean back I'm relatively pain free. Have tried acupuncture, chiropractic care, deep tissue massages, injections, NSAID medication, and the list goes on and on. None of which give me any pain relief whatsoever. Could this be a posture issue? If so, might this brace help. Also struggle bad discs in lower back and have my C1-C2 fused in my neck. However, the upper wasn't an issue until after the wreck. Any insight is greatly appreciated. The Saunders posture support will help with your posture and that may aleviate some of your pain however, it sounds as if you are still affected by the injuries in the accident. Even though you did not injure your neck in the accident it still could be the reason now that your neck is in pain. I have had neck arthritis for years. I was in a car accident and had a severe sprain of my neck. I am now recovering but I feel I need some support in my upper back due to previous injury. Would you suggest this brace? Chest size is 36. Any suggestions would be great! Thanks!!!! I have mild scholiosis and am looking for some relief from my mid to upper back pain. The pain is the worst when I sleep and wake up in the morning. Can this be worn while sleeping or would it be very uncomfortable? Or any other options for sleeping? I spend long hours at a desk working on a computer. I tend to slouch forward and my shoulders roll forward as well. Will this brace help me sit up straight or is there another product you might recommend? This brace will help correct your shoulder posture sitting as well as standing. It will not help to sit up straight. My mother has scoliosis and has small shoulders and a bigger waist and is very short from her waist to her shoulders, she wants to have her shoulders pulled back, Does the length of the straps from waist to shoulders adjust on this product? The way the picture looks (back) it seems the straps would be too long and slide right off! Would this product work for her or is there another one that may be better based on my description? Thanks so much! Can this be worn under clothing or must you wear some kind of t-shirt? If worn over the skin, I suspect it will need to be washed often. How long does it take to dry? You may want to wear it over a shirt so it soesn't irritate under the arm. I have scoliosis (mild) and I would like to know if this brace pulls the shoulders back for a correct posture. Thank you. Will this brace work for someone who is short waisted? Most are too long. My father is 6'6" tall with a 38' waste, and I am concerned about the height/length fitting. He has a very long torso. What size would you recommend? I wear 34 inch jeans not sure which brace to order? You fit into a Medium Brace. I have just checked we do not have this product available in black in either one of our Product Lines; ProCare, Bell Horn, Donjoy. Im a larger guy, i were 3x-4x shirts and a size 46 waist. Will the large back brace fit me comfortably? The size large accomodates a 42-54 waist measurement. It has a velcro attachment so that you can adjust the waist strap. Can this be worn while golfing? Yes, this brace may be worn while golfing. We also have more options, follow the link below. Hi I need a saunders sport all back support XXL in BLACK but it only shows white can you help me? I am sorry, we only have that item available in white. My waist is 30 inches. Will small be too small and meduim to large? I am 5'9" and 144 lbs with a suit size of 36. We recommend ordering the size small. I am looking to buy the Saunders Posture Support for the back, I wear a size 42 jacket. What size should I order? 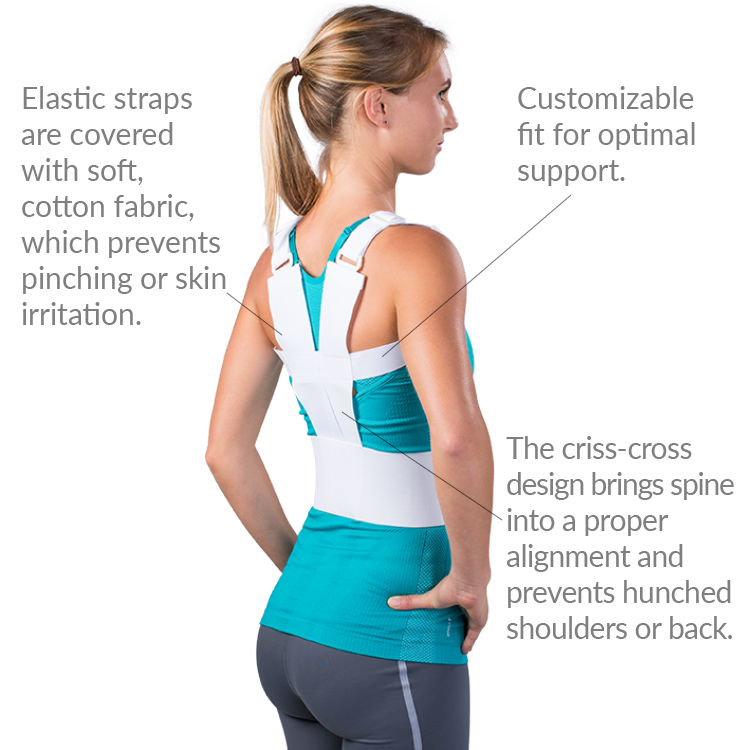 The Saunders Posture Sport Upper Back Support is sized by waist measurement. Please see the size chart on the main product page for more information. I have also included the sizing chart here for reference. I have tried many other posture braces and returned all of them. I finally found this brace that is comfortable and easy to put on and does what it says it should. You will probably want to wear a T-Shirt under the brace because if you adjust the straps really tight like I do, it does hurt the underarms a little. I would have given this five stars, but I am only critical of the arm straps which when are under the arms can irritate and would recommend someone to wear a thin cotton shirt underneath. I had purchased this same brand online about ten years ago to help me with my upper back/posture at work. I needed it due to a car accident I was in a few years prior to me purchasing it. I had a compound fracture in my upper back, behind where a bra strap would land. The doctors said I would be in pain for the rest of my life. I didn't believe it, but I am (mostly stiffness and right shoulder pain as well as lower back pain on the right side). I had to see a couple Chiropractors several times just to allow me to function and go to work. Anyway, during this time of seeing my first Chiropractor, I was also wearing this brace (in size Medium-I was a size 6/8), which helped to alleviate my slouching posture, allowing me to appear more confident, feel more confident, and not have compression in my lungs from a compressed rib cage! This product was a Godsend and I even wore it to another job about four years later where I worked in a warehouse and had to be on my feet for twelve hours, sometimes lifting 60 pounds (or more). I had ended up giving the brace to my friend who worked as a waitress and was smaller than me. I am probably a large now (even if I was a size 6/8 I would still be able to use the Large since it has a stretchy waist/Velcro) and will DEFINITELY have to get this when I can! Not only for me, but my mom, too who works hard at Ralphs and is on her feet for long periods of time, dealing with Osteoporosis. Oh I also have mild scoliosis which might be a source of grief for me which I'm sure this brace would help out. The central problem with this brace is that an XL is not available. Although my male chest size fall's within the Large parameter, the padded straps still dig into my chest where the shoulder straps pass under my arms. I've added extra foam padding to try to decrease that discomfort. The abdominal strap is not long enough to be worn comfortably while seated for more than 20 minutes. Instead of attaching the ends of that strap, I pull the brace down into proper position and lean back against the chair instead. Nevertheless, the brace does work -- it helps decrease the pain associated with my torn rhomboid minor muscle while working at the computer, by preventing me from relaxing into a forward-slumped posture at the keyboard. IF you easily fall within the stated size ranges, then the product is recommended. You can always adjust the shoulder and abdominal straps to make it smaller, so I would strongly encourage you to order up one size larger than you think you need. I ordered the other posture support from better braces and did not like it at all. So I decided to try this one. I can tell you I couldn't be happier. It does stay in place very well, not like the other one that rode up all the time. I wish I would have ordered this one to begin with. Helps posture very well, and is comfortable to wear. I think this product is well made and very helpful. If they ever make it in black I will buy it, if not I plan on getting a second one anyway. I had kyphosis from a childhood illness and am paraplegic in a wheelchair. In 2015 a drunk driver hit my van and my back broke. Before it could heal, another bone broke so my kyphosis is alot worse.I wear this back support every time I am up and when I go out in my wheelchair. Also it is good on bumpy rides on buses, etc. It helps support my back and shoulders and I don't feel so bent over. My only wish is that it came in black so it would be less noticeable and that it didn't ride up so i don't have to keep pulling it down. I'm at a point in my life where I'm not working and have to adjust to budgeting everything. I have a very long list of back problems but since I no longer have a car and couldn't get to the places to continue the care I need for my back so right away realized that I needed to be proactive and figure out a way to relieve some of my pain and discomfort while at home i was able purchase the Saunders brace for upper back support. My pain levels decreased, the relief is wonderful. There's some slight pinching in the beginning that's only because it is new. Just loosen it up. I used to slouch but no more. The Velcro is adjustable so it doesn't need to cramp your stomach, I chose to also wear a comfortable shirt to so that I can take the arm strap and place it to my comfort. I'm 46 years old with a daughter that is 18. My first order was for her because it was recommended through her chiropractor. She had been walking to school and back home everyday during the school years and was complaining of upper back pain. Just this year her last year as a student in High School class of 2016, after an x-ray, MRI and ruling out scoliosis, she had no disk bulging and no herniated disk. Part of her plan was for me to invest in a good upper back support brace for her. I ordered my brace for support as well just after my daughter graduated May 31, 2016. Could not ask for anything more. I were it everyday. Its very comfortable and helps alot. So very glad I found a different way to purchase this, instead of local clinics. This back support has helped for 20 years or more. Even with two people, we could not get this to fit or work properly.